Denbighshire pupils have taken part in seven exciting Alice in Wonderland themed schools’ competitions, designed with the curriculum in mind, full of thrilling curiosities, mad-cap fun and adventures, to inspire, educate and grow imaginations. A total of 15 schools signed up for this year’s Enrichfest 2019: Wonderland, Denbighshire Curriculum Enrichment initiative’s project, which has already featured themed school visits, celebrating Lewis Carroll’s Alice’s Adventures in Wonderland and competitions. Schools are now getting revved up for a ground-breaking, touring ‘pop-up’ theatrical performance of The Magic of Wonderland, plus puppetry workshops, at their schools. As part of the Cheshire Cat Challenges, children and young people aged between 5 and 14 submitted colourful and inventive Alice dress design entries, Queen of Hearts’ crown sketches, Mad Hatter riddles, Wonderland TripAdvisor reviews, Tea Party smoothie recipes, playwriting scripts and Victorian style photographs. In total 1,552 entries were submitted across the 7 competition areas. 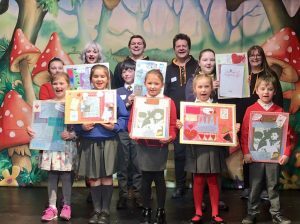 The eight prize winners took part in ‘Wonderland becomes Winnerland’ – a theatre production day, with Magic Light Productions, at Theatr Twm o’r Nant, Denbigh, on Thursday, 11 April 2019, to see their winning designs transferred from page to stage and brought to life in the theatrical production of ‘The Magic of Wonderland’, touring Denbighshire schools in May and June. The creative team are now busily curating Alice in Denbighshire – The Cheshire Cat Gallery, which will be held from 15 May to 19 July 2019, at County Hall, Wynnstay Road, Ruthin. This ‘must-see’ exhibition will be open to the public and features children’s work drawn from entries in this year’s competition. Denbighshire Curriculum Enrichment initiative is a project run by Denbighshire County Council’s Education and Children’s Services to enhance pupils’ learning and support young people.